2000 AD has signed an option deal with the US' Fine Line Features for the film rights to Outlaw, marking the first big-screen appearance of a character from the Galaxy's Greatest Comic since 1995's Judge Dredd. Director Andrew Upton is expected to shoot the $10m-$15m project in 2001 from a script by Lloyd Foneville, co-writer of Universal's highly successful The Mummy. The futuristic story follows a reformed criminal who is forced by a weapons-design company to come out of retirement to compete in their Deadliest Man Alive gun-fighting contest. The deal for film, TV and game rights with Fine Line marks a rapid move into exploiting the 2000 AD stable of 700-plus characters after UK software developer Rebellion bought the sci-fi and fantasy comic in July 2000. Rebellion owners Jason and Chris Kingsley have formed 2000 AD Entertainment with media lawyer Andrew Curtis to exploit film, TV and ancillary rights on 2000 AD's trademark characters, including future lawman Judge Dredd, mutant bounty-hunter Strontium Dog, and genetically-engineered super-soldier Rogue Trooper. "It's very exciting to have got this together so quickly," Curtis said. "This will help re-launch the 2000 AD brand in America and, we hope, lead to longer term relationships with Fine Line and New Line because of their expertise in the comic book genre." Fine Line is a subsidiary of New Line, responsible for hit comic-book adaptations The Mask and Blade. 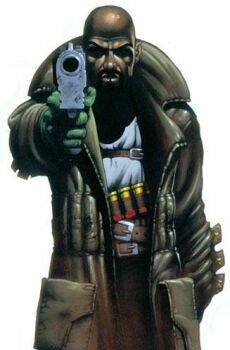 The deal, negotiated by Frank Smith at Fine Line and Curtis' Drew and Co in London, came together Rebellion when it acquired 2000 AD. The Kingsleys and Curtis are taking executive producer credits.